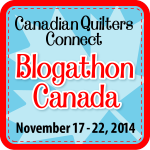 Welcome to Day 3 of the 2014 Blogathon Canada blog hop, hosted by Sew Sister's Quilt Shop! On today's stop, I am excited to be representing Alberta alongside the incredibly talented Leanne from She Can Quilt. For new readers to our blog, my name is Kelsey, and I blog here at Everyday Fray with my cousin Amanda (who is really more of a sister/enabler/confidant). Though we are both Canadian, I am currently the only one holding down the fort up here in the Great White North, proudly residing in Calgary, Alberta. While Amanda has sought temporary refuge from the cold down in sunny California, she is undoubtedly Canadian to the core (and we hope to woo her back here one day!). If you'd like to know more about our journey, feel free to read more about us here! Our blog is a compilation of both of our crafty imaginations, and the content on our blog is written by A (Amanda), K (Kelsey - that's me! ), or A&K. While our focus is modern quilting, we strive to challenge ourselves, and often include various other crafts we're working on like sewing, cross stitch, needle work, weaving, knitting etc. Now onto the fun part of playing blog hop hostess, let's have a giveaway! 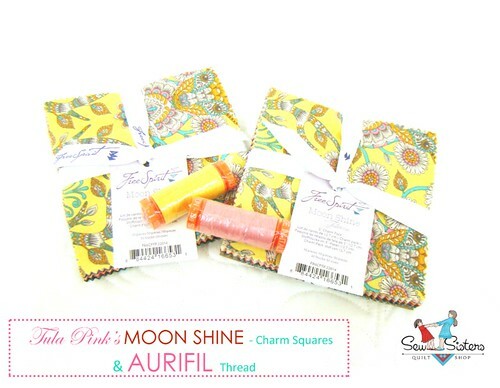 Sew Sister's have generously donated a giveaway today for our readers - two charm packs of Tula Pink's newest fabric line Moon Shine, as well as two spools of matching Aurifil thread! For an opportunity to win this coordinated collection, please comment below letting us know your favourite way to use charm squares. The contest will stay open until 11:59 pm MST on Sunday November 23rd, 2014. The winner will be announced on our blog on Monday November 24th, 2014.
International entries are welcome (you don't have to be Canadian to hop along with us!). If you are a no-reply blogger, a wordpress blogger, or do not have a blog account - please leave your email in your comment so we can contact you if you win! Be sure to swing by the Sew Sisters Blog today as well to check out the full list of blog hop hosts, as well as a chance to win another prize from one of our lovely Blogathon Canada sponsors, Northcott Fabrics! I just pulled from stash a bunch of 5" charms that were waiting on a project. I will be making a HST quilt called Lattices from Moda Bake Shop. There are so many great quilt patterns out there. I like Wedding Dress's 100 square pattern. MQC has bunches. They are just all hun. Billie Lauder has great ways for 4 patches. I have just finished my 1st charm square quilt, with a set of Moda Rite of Spring charms. I am not close to a quilt store so don't have opportunity to buy them, For this quilt I sewed 9 patches, cut them in half both ways, and sewed them back together, I didn't love the fabric design but do love the quilt. Greetings from Cape Breton! You've both done some amazing work. What a delightful post. I don't blame your cousin one bit...I'm heading to TX soon to escape the winter, myself. I am usually boring and use charm squares to make straightforward patchwork quilts! I would like to try them in other blocks though. what a love post and blog!!! I am going to follow you now...so glad I came over fromBlogathon Canada. I love everything you do, but love your cardigan...good job girls!!! Oops, forgot to tell you...I would make a quilt with these charms. I've made a couple of cross quilts using charm squares. I've also made some tumbler quilts from charms. I like having someone else do most of the cutting for me. Thanks. I love collecting fabric and have no idea what I would do with it at the moment. Thanks for hosting. Hi There, and thanks for hosting the blogathon. I am always puzzled when comes time to use pre-cuts, but I think my next charm project will be to pair with a solid, and make a bunch of HST which I will then turn into a small-baby quilt, or perhaps I will add some solid squares and borders to make the quilt bigger. I use charm squares for many projects and they're perfect for making mug rugs/coasters. Charm squares make projects quick and easy and I'm all for Q & E! It was nice to meet you ladies. Charm squares are perfect for Disappearing Nine Patch blocks. I like to mix charms from different fabric lines. Love your projects, seems you girls are multi-talented! You gals are tremendously talented and now that I have discovered you, I will follow you! Thanks for the chance to win such beautiful fabric! I use charm squares in baby quilts...perfect size! 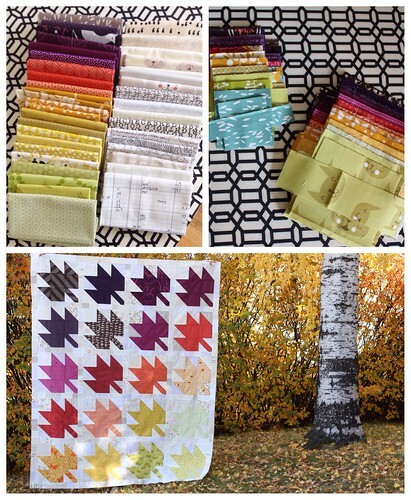 Beautiful creations, especially your Modern Maples quilt... wow! Thanks for sharing in this all Canadian hop and giving links to other Canadian bloggers for me to follow!! Wow! Great project and so colourful. I can see a nice bag from these charm pack. Thanks for sharing! 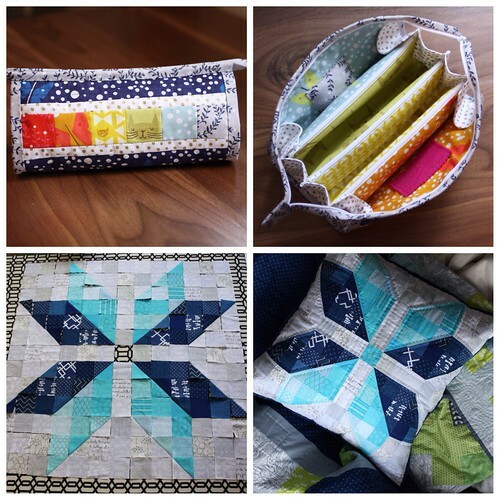 I like them for simple patchwork quilts and also for HST blocks-you can make so many different designs with that block! Fun to experiment with the precuts and try to learn new blocks too. I like a good zigzag quilt and these charms would be perfect for making the most fab quilt ever. Thanks for the giveaway. Now back to exploring your blog. I like making lap size quilts with charm squares. I use them mostly for simple patchwork. I love your catnip dresses. I use them for lap quilts. I use charm packs for quick quilts, as well as half square triangles, easy peasy. Love all of your quilts, totes, etc.. Everything looks simply stunning. Thanks for the chance. HSTs are so easy with charms and so versatile. Thanks for the opportunity! Not sure if it took my comment-so trying again...I like to use a charm pack all in one project-like a baby quilt or bag. I love making lap quilts. fast and cute! Charm squares make great fast baby quilts! I love charms packs because they are just the right size to work with. I live in Alberta as well. Only a couple hours south of you. I love to use charm packs for half square triangles. They are the perfect size. wonderful projects you have made. Love the Tula Pink fabrics. Charm packs are just great for so many projects. Love the variety in your work. Wow, amazing quilts and blog! I will be coming back often! I like to use charm squares for smaller projects. I have somewhat of an addiction to charm packs. There are so many great patterns to use them, but I would say my favorite is runners & toppers. Most of the time, I'm all about quick results. i don't tend to use charm packs, but i'm sure i could find a use for those beauties!!!! thanks for the chance to win! My favorite way to use a charm pack is to split it up among projects. They're great for whipping up zippy pouches or mixing up among different quilts. Thanks for the chance to win! I enjoyed getting to know you both a little better and seeing some of your lovely finishes. also addicted to charm packs. cool that you blog together! I would love a chance to win a pack of Tula's new charms. I like to mix and match different designers and use them to make scrappy panels for bags and pouches. Next on my to-do list is to start planning the panels for a sew-together bag. Your catnap bag above is such an inspiration. Love using charm packs to make mini quilts! That way I get to try different patterns, actually get done and can be used as wall decor or table toppers!! I'm in Wisconsin but miss Alberta a lot! Charm squares are great for simple quilts or half square triangles. Thanks for sharing! I enjoy using them as charms, in HST or cutting them up to use in miniature quilts. Enjoyed visiting your blogs. I use them to make basic patchwork quilts, The charm pack gives me the colour combination, and then I root through my stash to add what I have. Thank you for hosting on behalf of our province today! Your blog is lovely and I am totally feeling the Catnap love - I may be hoarding some of this myself!! Thanks for a nice giveaway! I like charms for controlled scrappy. I love using them in miniatures! I would use the charm pack to make charity quilts. Love your quilts and look forward to exploring more of your blog. I don't think I've bought charm squares before. I would probably use them for embellishing little zippered bags. I like making bags/pouches and tiny projects with my "scraps", I haven't bought charm squares before. I love to use charm squares for quilts and table toppers. I'm especially having fun with HST designs right now -- there are so many to play with (I especially like the star patterns). I love using charm squares in the blocks I'm making for the #instabeehive I'm in right now. It's a great way to use up some fabulous fabric!! I am new to quilting but have been playing with charms and my new QCRuler. Thanks for the chance! I actually like using them to do disappearing nine patch table runners or quilts. Thanks for letting us get to know you! Charms are so versatile! I love making half square triangles or doing a stitch and flip method to create other shapes. I love your quilts, especially your leaf one! Thanks for this opportunity to win the Moon Shine charm pack and aurifil thread. I make a lot of bags with charm packs for my 4 grandsons to give their teachers either at the holidays or end of year. This would make a fabulous bag! Thanks for introducing us to you. Will come back in the future to see what you are up to. Thanks for the giveaway opportunity as well. I haven't used any charm packs, yet, but I would use them for a nine patch quilt or making bags. Thanks for the chance to win! Love turning them into a quick quilt - just add sashing. Or for something a little more complicated looking, turn them on point. THANKS for the chance, LOVE your dresses!! So lovely to see you hosting this year! I love seeing all the gorgeous projects the two of you make. You're so talented! Charms are great for pillows, mini quilts and bags. Thank you! Love your dresses. I wish I could make them. I haven't used a charm pack, even though I have bought a couple and they sit in my stash. I do want to try making a bag and I think charm packs are the way to go. I also would use them for table runners, toppers, etc. I have used charms a couple of times. I like to do the d9p type block. i'll admit i haven't used my charms, so I'll say my fav way to use them is to collect them. I love Tula Pink! I usually buy charms these days and enter charm swaps because I like having the squares already cut. I use them in HST quilts and there's already so much trimming involved with that that any reduction in cutting is welcome. ;) Thank you so much for including the link to my blog (Daydreams of Quilts) and for hosting for Alberta. Love all your projects! I love sewing scrappy quilts so charms are great to have! Thanks!! I like charm packs for baby quilts or for using as a focal point for bigger free form quilts. Your projects are gorgeous! i just made a quilt using the mini charms and would love to up size it with a charm pack. so i think they are great for kid/toddler quilts. You two sure are talented. I love the dress done two ways. Thanks for the links to other Alberta bloggers too. So many pretties!!! I use them for baby quilts and mini quilts! Thanks for the chance! What lovely items you make. Thanks for a chance to win. Love making pinwheels with charm packs. Thx for tips on other Cdn bloggers! thank you for the opportunity to participate in your draw. I use charms for baby scrappy quilts. Here from the Blogathon! Lovely lovely stuff - I especially appreciate the colours of your African Wax Resist quilt! Thanks for the giveaway! Oh, we're supposed to use Charm Squares, I've just been quietly caressing them...actually they're fun in everything from tote bags to quilts. I have made baby quilts and just simple nine patch quilts with charm squares. At the moment I am making a fidget for people with Alzheimer's disease. This is a project my guild is doing. I love to use charm squares for quick and easy baby quilts, or small projects like bags and pillows. Thanks for the chance to win, and the link to my blog! I haven't used them yet, but I'm planning a handbag with them. HI, love to use Charm Packs for my scrappy baby charity quilts right off the stack! So cute! Thanks for sharing! I like to make them into half-square triangles and then arrange them according to a pattern. Thanks! I use charm squares for all sorts of things. I have just cut some into quarters to make 2.1/2" squares for a scrappy quilt I am doing. Thanks for the giveaway. I've been following you for a while and I always thought you two were sisters!! I like to use charms to make HST's! I love all of y'alls stuff! I like to use charm squares for quilts! My favorite way is as the center of star blocks. I love charm squares for scrappy quilts. I love to make HST's from charm packs and turn then into tablerunners. Most of the cutting work is done when you use them. Thanks! I am seriously loving that sew together bag! It is just lovely. I've made a scrappy version and think the pattern is so versatile. Charm squares are great for baby quilts, half square triangles, sew and slice. Tula Pink is one of my favorite designers. Thanks for the chance to win. I've used charm squares to make HST's for a quilt. Please use lflemin at msn dot com for my email. love that pillow! I love looking on moda bakeshop for ideas on what to do with charm packs. If all else fails, a disappearing nine-patch always does the trick! Wow, happy to find another great Canadian blog. Charms squares are perfect for all types of quilted items like table runners and baby quilts. Charm squares are great for making HST quilts. Nice to find your blog for some new inspiration. I would say an apron designed by a local quilt shop in Fredericton is s definite favorite. Table runners and placemats and mug mats. The variety of different fabrics make charm squared do fun to use. You African Wax Print quilt is stunning! Hi Kelsey! Love your Modern Maples and that camping quilt.... Oh, yeah and that Snowflake cushion! Your Grace cardigan is gorgeous, too. Come to think of it.... Everything you make is beautiful! Love your projects. This Blogathon is a great way to add to my list of blogs to visit. Charm packs are great for table runners and cushions. Charm packs are great for lap size quilts or baby quilts. Add a neutral and create half square triangles to make a zig zag quilt. Or a disappearing nine patch. Thanks for the chance! I found a great tutorial on a disappearing four patch, which I am going to try out shortly using charm squares. It will be a donation quilt for our guild. I actually have not made anything using charm packs yet.. bu there are so many great projects out there. I absolutely love the dress you posted (who doesn't love a dress with pockets?!) it's on my to make list! I like to make totes with charm squares , they work up quickly and look great too. Thanks for the chance . I like to use them to make tiny churn dash blocks! Thanks for the chance! I love to make HST with them...so many options for layout then! I like to use charm squares to make half square triangles. Love your grace sweater. I've seen that on ravelry before and so impressed with yours. I want to make a pillow type quilt I recently saw using Charms..... looks easy and quick...we will see! Wonderful to meet you both! I love using charms to make churn dash quilts. Half the work is done by using pre-cuts! I like to use charm packs in disappearing nine patches. I love to use charm squares to make a quick lap or baby quilt. I haven't made a quilt with charms yet but want to make a disappearing 9-patch. Beautiful things you have made. I love to use charm squares to make lap quilts and baby quilts. Thank you for the giveaway. I use charm squares for simple patchwork quilts, because usually it was the fabric prints that were the reason I bought them, and I want to show them off in the project. I have trouble with the pre-cuts; designing to use them all but have enough for the project. But, they are all so appealing. Currently my favourite way to use charm squares is to admire them on the design wall as I design away in EQ. I've only used charm squares once, and I used them for neutral spaces in an otherwise busy quilt. Thanks for the giveaway and I love your sewing. Love the versatility of charm squares. Recently I've made multiple pillows, cutting my 5" into four 2.5 inch squares, or sandwiching two together and splicing into 1/4 square triangles. Mostly I love to chain piece charm squares for future quick projects, like your sew together bag, totes, mini purses for my quilt friends, pincushions. Thanks for partaking in the Blogathon...I've made so many new acquaintances in Canada. What a blessing! Beautiful quilts! I hope to do that well one day. Thank you for the chance to win! Just love blog hops! This is my first visit to your blog. I'm really enjoying the blogathon. Love Tula pink fabric, so would love a taste of the new collection! Thank you for taking part in this great cross Canada quilt party. It did say that I am a first time visitor and that I love your work. I've used charm squares for many projects! Patchwork quilts, half-square triangles, and applique are just a few. They are enormously versatile! I'm visiting from the USA...and I love charm squares. I love that I get to see all the fabric in a collection with one relatively small investment...and they end up in quilts & scarves & table runners...oh...and pillows, too. Your blog is wonderful. Thanks for the chance to win. Most recently I have used them for HSTs, but I have been scheming won't stars with charm packs. Great fabrics for a giveaway! I love using charms in making thumb pincushions, and D9P blocks. Love these fabrics.. so happy and warm! Would be perfect for preemie quilts I donate to the local hospital. I have to admit, I have no favourite way to use charm squares because I have never used them..I am however, charmed by you both and will be back to visit your blog again! First time here and love your projects! I love charm packs to make HST.! I use charm squares to make placemats and runners. So far, my favorite charm square project has been a fun tote bag from Fairly Merry's blog. I'm currently making one for each of my two nieces as Christmas gifts. I love the scrappy, yet coordinated, look a charm pack gives. I use charm packs for lap quilts and placemats. You are very talented! Thanks for the giveaway. Charms are so versatile and I use them for many projects. Love, love, love your style! And charm packs! They are perfect for scrappy quilts and I use them for almost every kind of quilt I make! I love to use charm squares to make baby quilts. Thanks for the giveaway. I love charms to make fast gifts for friends and family - table runners, clutches, and placemats! Thanks for sharing. Charm squares are great for baby quilts. Thanks for the giveaway. I like them for hst quilts and for baby quilts with dashing in between. I love using them for charm quilts and I also love to use them in applique. I love charm squares! I like to use them to make simple patchwork quilts. What can't be done with charms? Love them. I like to make disappearing 9 patches or coin quilts. 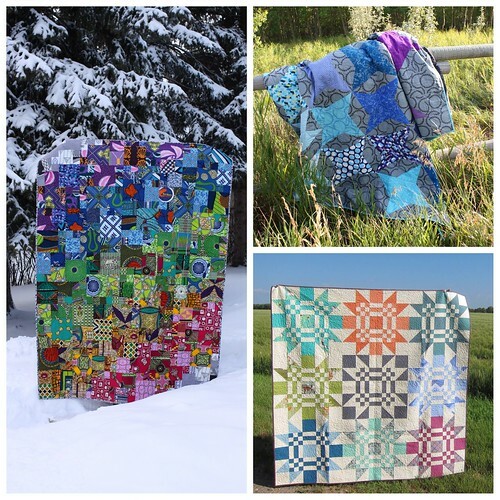 I just love the colours of your quilts! They are fabulous and I too live in the great white north of Calgary. I love making baby quilts for my young grandchildren with charm squares. With a few blends, a good size crib quilt can be made. I like to use charm packs in table runners and placemats. I love charm packs for making bags, or I like to use them when making fast quilts. All my coworkers are having babies -- as an "honorary" grandma, I use charms to make baby quilts! Thanks for sharing your lovely blog! Thanks for hosting on behalf of Alberta :) I love charm squares to make anything scrappy! Hi! You have such terrific quilts, and I love your multiplicity in your creativeness. I've been wanting to make a shadow quilt with charms. I keep seeing them and think they're just gorgeous. I'm actually making an oversized king with HSTs using charms. I like them as is and for HSTs. I made a twister quilt (table topper, actually),which was fun. I use charm squares primarily in baby quilts. Thanks for the wonderful giveaway, and for your delightful blog! I have never used charm squares but I am sure I would find a use for them. I like to use charm squares for patterns like the disappearing 9 patch pattern- makes it easy peasy to do.. Thanks for hosting the blog hop and I am going to check out some of the other Alberta blogs.. I've never actually used charm squares, but I think they'd be great for an HST design! So many beautiful things here, love your African Wax Print Quilt. Favourite way to use charms is actually just laying them out and sewing together to get one lovely quick little quilt, sometimes a touch of applique on top is nice. Would love to win this charm pack. I haven't used a charm pack yet, but I plan to make a tumbler quilt, and charms are the perfect size.